Shimano's name for the hollow forged cranks used with Octalink ® splined bottom brackets. These lightweight cranks are made by welding two forged aluminum channels together. The two-piece crank /bottom bracket system introduced with the 2004 10-speed Shimano Dura-Ace line. These use external bearings that hang outboard from the bottom bracket shell. The stationary body of a brake lever, the part that attaches to the handlebars. This term is normally used when describing brake levers intended for use with drop handlebars, where the hood is intended to act as an alternate hand rest. The rubber cover that fits over the body (above) of a brake lever. A rim with a ridge on the inner edge to help retain the bead of a clincher tire, as shown in the cross section at the right. Some older rims were straight-sided, and will not hold a tire as securely as a hook-edge rim (that is, the tire cannot be inflated to as high a pressure.) Virtually all good-quality rims in current production are of the hook-edge type. The drops of a drop handlebar, as in "riding on the hooks." The outer sleeve through which a brake or gear cable is pulled. The housing transmits an equal push to counter the pull on the inner cable. Traditional housing consists of a tight spiral of steel wire, usually coated with plastic. Newer versions have synthetic liners to reduce friction. This type of housing is still used for brake cables. See also Bowden cable. With the advent of index shifting, greater precision was required, particularly for handlebar-mounted shift controls. For this application, "compressionless" housing is now used. This differs from traditional housing in that the wire part consists of a bundle of parallel wires, running more-or-less parallel to the cable, reducing the tendency of the housing to change effective length when it flexes as the handlebars turn. This type of housing should not be used for brake cables, as it is likely to rupture under the higher loads involved in braking. A fitting found at each end of a piece of cable housing. It consists of a socket to receive the housing, with a small hole at the bottom, which will let the inner cable slide through, but hold the housing end rigidly in place. This may be a braze-on, or may be part of a clamped-on part. An adjusting barrel is a type of housing stop. Human Powered Vehicle. Technically, any vehicle powered by human muscle qualifies, but in common usage, "H.P.V." tends to refer to vehicles other than conventional diamond-frame bicycles. See the I.H.P.V.A. Website. The middle part of a wheel, to which the inside ends of the spokes attach. 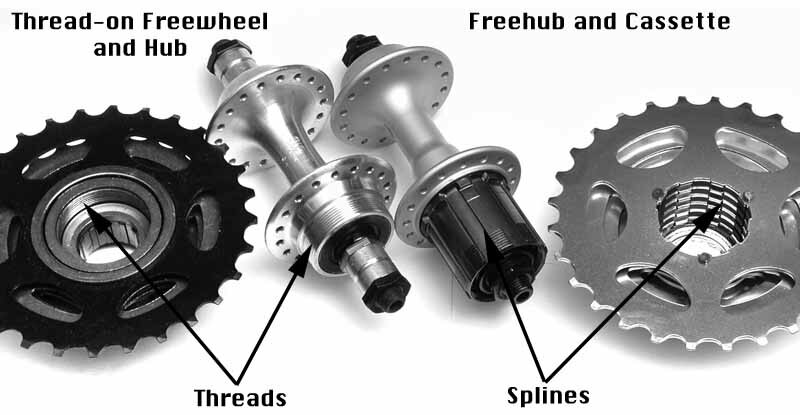 A hub consists of an axle, which attaches to the forkends; a shell, to which the spokes attach, and bearings to connect the axle to the shell, permitting the shell to revolve around the axle. In the case of a rear hub, the shell would also have a provision for attaching the rear sprocket(s). Some hubs incorporate a coaster, drum, disc or roller brake. Some rear hubs also incorporate internal planetary gearing. A brake that is incorporated into the hub of a wheel, as opposed to a rim brake. Hub brakes activated by back-pedaling are called coaster brakes ("back-pedal brakes" in British usage.) Hand-operated hub brakes include disc brakes, drum brakes, and Rollerbrake ®s ®. Hub brakes have the advantage of being weatherproof, so they work as well in the rain as when they are dry. Effectiveness of hub brakes varies greatly from one type to another; see the entries about each type. A disc or drum brake is commonly fitted as drag brakes on tandems to avoid the risk of overheating the rims and blowing out tires. See my article on Tandem Brakes. But on the other hand, coaster brakes overheat very quickly on downhill runs. Disadvantages of hub brakes include greater weight, greater stress on the spokes, and increased difficulty in removing/re-installing the wheel. Huret was a major French manufacturer of derailers. Its best-known model was the "Allvit", introduced around 1960. The Allvit was the first inexpensive parallelogram-type derailer, and hundreds of thousands of them were sold through the mid 1970s. Most Schwinn Varsities used this model. The Allvit was a very sturdy unit, well made and reliable. Its parallelogram was pivoted on bolts that could be adjusted, unlike the rivets used in most derailers. The orientation of the parallelogram permitted the jockey pulley to track the cluster more closely than most derailers of its time. Unfortunately, the Allvit had a very strong return spring, which caused cable stretch to be excessive, degrading shifting performance. The strong spring also tended to lead to rapid wear and failure of shift cables. Another famous Huret model was the "Jubilee." The Jubilee was expensive and lovely, and has the distinction of being the lightest rear derailer ever made. It is much sought after by collectors and weight weenies. The Huret "DuoPar" touring derailer had two parallelograms (hence the name). The extra parallelogram was used to move the jockey pulley up and down, permitting the DuoPar to handle a wider gear range than any other rear derailer before or since. The original DuoPar was quite expensive, and featured titanium parts. A later, less-expensive version, the Eco DuoPar, was also available for a while. In the 1980s, Huret was absorbed by Sachs, and Sachs, in turn was taken over by SRAM. Hybrid bicycles, also known as "cross" or "fitness" bicycles, are a cross between a mountain bike and a touring bike. The best of them have the handlebars and control levers of a mountain bike, with the frame, gears, wheels and brakes of a touring bike. Hybrids usually come with 622 mm (700c) wheels like road/touring bikes, but with wider tires than are normally supplied for touring. Most hybrid bicycles, unfortunately, come with tires designed for looks rather than for function. These are typically knobbies 35-40 mm wide. These tires are not good for much. Knobby tires are good for dealing with soft sand and mud, but hybrid tires are too narrow for these conditions -- if you plan on riding through soft sand and mud, you really should buy a mountain bike. When ridden on firm surfaces, these tires are noisy and slow, and can cause an irritating buzz as they roll. They also corner poorly on pavement. Many hybrids, unfortunately, also take from the mountain bike side of the family, a high bottom bracket. High bottom brackets make sense for mountain bikes, which are intended for jumping over logs and threading through narrow singletrack. Since hybrid bikes are generally unsuited for this sort or riding, the awkwardness of mounting and dismounting with a high bottom bracket outweigh any possible advantage. This is particularly the case since hybrids are often used for urban cycling, where stop-and-go is the norm. Hybrid gearing is the use of both derailer and internal gearing on the same bicycle. Hybrid gearing has traditionally been a do-it-yourself option for bicycle tinkerers such as myself, usually by adding a derailer to a Sturmey-Archer hub. I have a 63-speed bicycle using this system. Hybrid gearing is no longer limited to the do-it-yourselfer, since the Sachs/SRAM 3 x 7, 3 x 8 and and 3 x 9 hubs have become generally available. These are 3-speed planetary-geared hubs designed to accept a Shimano-type cassette. Hybrid gearing provides close spacing with a wider range of gears than can normally be obtained with a single-derailer system. It is also particularly well suited to bicycles with smaller than usual drive wheels, because the increase top ratio of the internal gear hub eliminates the need for unusually large chainwheels to compensate for the small wheels. Operated by applying pressure to liquid in a tube. Some bicycles (and all automobiles) have hydraulic brakes, using liquid-filled tubing to connect the brake control lever to the caliper. Hydraulic brakes have less internal friction and are immune from cable stretch, but are expensive and harder to service than cable operated brakes. When an automobile is driven fast on wet roads, especially if it has worn-out tires, a cushion of water can build up under the tires, preventing the rubber from contacting the road. This is very scary and dangerous, because it leads to a total loss of traction. Fortunately for cyclists, this cannot happen to a bicycle; they don't go fast enough, nor have a large enough contact patch, nor do the tires run at a low enough pressure to make hydroplaning possible. An ill-founded fear of hydroplaning often leads people to buy bicycle tires with inefficient tread patterns, when they would be better off with slicks. This was a handy tool for removing the lockring that holds the sprocket cassette to a Freehub. It consisted of a fitting to engage the lockring, with a thin arm. The arm is bent and padded at the end, so that it will bump up against the frame's chainstay. To use a Hypercracker, you remove the wheel from the frame, install the Hypercracker into the lockring, then put the wheel back in the bike. When you turn the pedals forward, the Hypercracker's arm bumps into the frame, and the cassette turns while the lockring is held immobile by the Hypercracker. The Hypercracker is the only single tool that will remove a cassette lockring--normally, you need a lockring tool and a chain whip. Since the Hypercracker used the bicycle's drive train as a chain whip, it was particularly handy for the touring cyclist, because it was a small, easily portable tool. Unfortunately,the Hypercracker is no longer in production. Shimano's buzzword for compact drive. Specifically, this refers to cassettes which feature an 11 tooth sprocket, and the bodies designed to accommodate them. Due to clearance problems, the cutaway between the splines on 11-tooth sprockets only goes halfway through the sprocket. The matching splines on HyperDrive-C bodies don't go all the way to the outer end of the body. You can use HyperDrive-C cassettes on conventional bodies by adding a 1 mm thick spacer to the body before installing the cassette. This is a standard spacer commonly used for fine-tuning chainline with conventional freewheels. It may be necessary to add a spacer to the right side of the axle in some applications. More information on Hyperglide cassettes is available in a separate article on this site. A system of ramps and special-shaped teeth on Shimano rear sprockets that permits much smoother shifting than older systems. HG sprockets are designed so that, as the chain moves from one sprocket to the next, it will engage the new sprocket before it has completely derailed from the old one. This makes for smooth, silent shifting. Hyperglide requires that the teeth of adjacent sprockets be oriented specifically with respect to one another. It also reduces interchangeability to some extent. For example, a 17-tooth sprocket that is designed to be used next to a 16 tooth sprocket will be shaped differently from one designed to be next to a 15 tooth. That doesn't mean that you can't customize a Hyperglide cassette, but does mean that if you do customize, you will lose the Hyperglide functionality for some of the shifts.